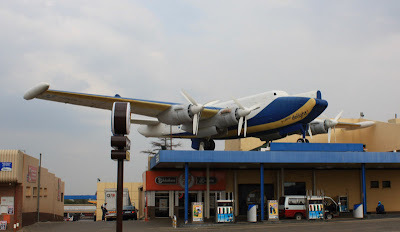 Steve Sheckter posted a grand old photograph above of the Vickers Viking that used to sit on top of Vic's Viking Garage (Filling station) on the Old Potchefstroom Road near the Uncle Charlies' Interchange in Johannesburg. 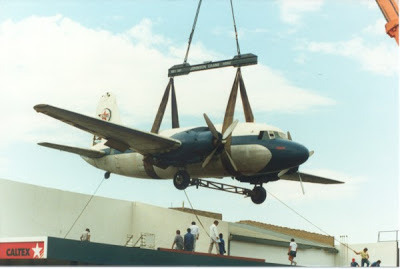 In later years (1987) this aircraft was removed, and a restoration projects started. 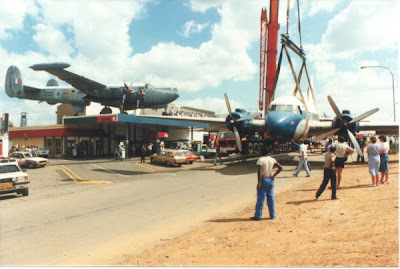 It was replaced by one of the Avro Shackletons from the SAAF, and that aircraft remains there to this day. Sadly it does not appear that the restoration was completed. As I child it was one of my biggest thrills to go past this filling station, and occasionally stop there to fill up. I think my Dad was aware of this, and indulged my aviation lust. He also took me to the Jan Smuts Airport to watch planes occasionally. The Vickers VC.1 Viking was a twin-engined short-range airliner derived from the Vickers Wellington bomber. The initial nineteen production aircraft (Mark 1A) carried between 21 and 24 passengers. The fuselage was metal but the geodetic wings and tail planes were fabric covered. The aircraft has two Bristol Hercules 630 engines. These are 14-cylinder two-row, sleeve valve, air-cooled radial engines developing 1,690 hp each. The VC stands for Vickers Commercial, sometimes also called Vickers Civil. 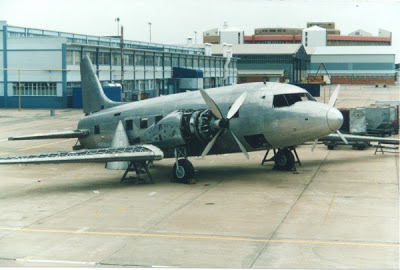 Built at the Vickers-Armstrongs factory in Weybridge, England, c/n 121 first took to the air on 30 August 1946, registered as G-AHOT with British European Airways and was used in the 1948 Berlin Airlift. 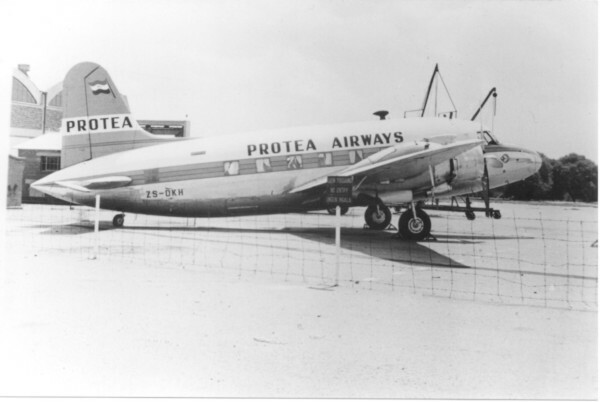 On 26 September 1954 she was sold to Trek Airways, registered ZS-DKH and operated in Protea Airways colours, a second airline of Trek, and for many years, transported hundreds of passengers on leisurely and scenic flights between South Africa and Europe. She even starred in the film, “Kimberly Jim” with the late Jim Reeves. After 13.881 flying hours she was disassembled and transported by road to Armadale south of Johannesburg, where, in January 1963 she was lifted on to the roof of the Vic de Villiers “Vic’s Viking Service Station” where she became a famous, if forlorn, landmark. 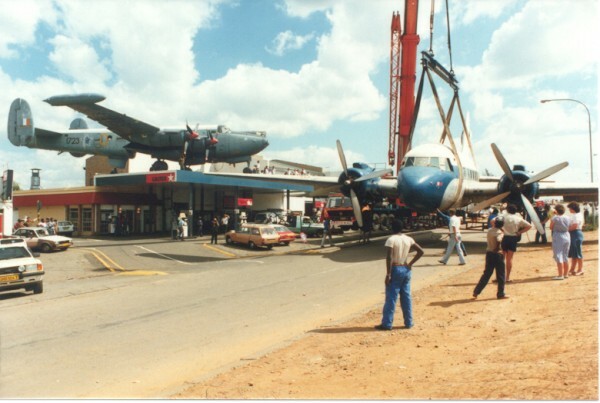 On 5 March 1987, the Viking was replaced by SAAF Shackleton 1723 and donated to the SAA Museum Society. The Viking’s wings were removed and she was towed to Jan Smuts Airport. 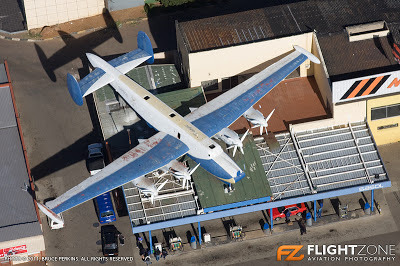 Unfortunately 20 years plus later, in 2008, the aircraft had not been restored and was a tatty hulk standing not too far from the engine run-up bay at OR Tambo International Airport. 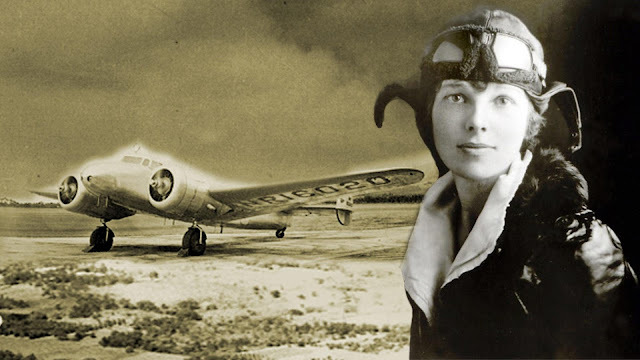 More on the history of the SAAF Shackletons: a 2-part post on those magnificent ladies. 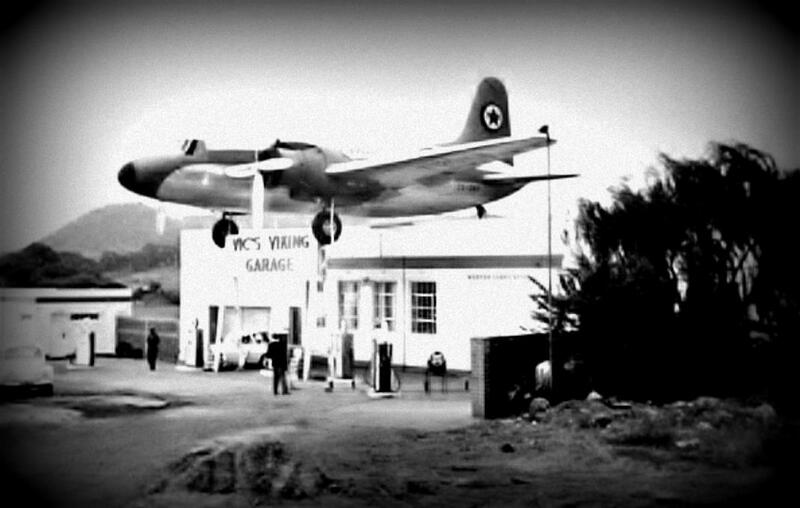 Vic's Viking Garage belonged to my grandfather - Vic de Villiers, we all have a love for aviation because of his love of it. 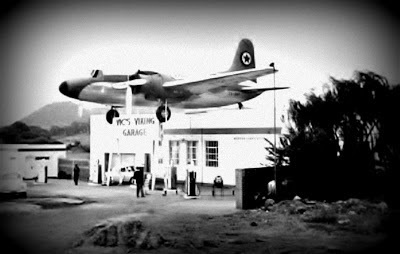 We even had a flight school (Vic's Flight Centre) at Rand Airport. Lots of memories. Thank you for the pics and the write up I will pass it on to my grandfather - he is now 90yrs old :). Hi Herman. This plane was flown by my father Lourenzo De Villiers Giani ( no relation to the garage owner) when it was bought by trek airways and later by Protea airways. He was the last Pilot to fly it. 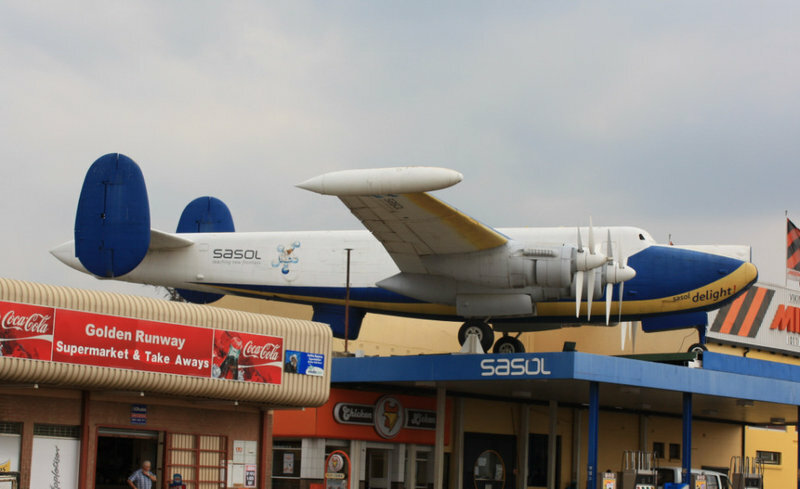 As far as I know it should be at the Rand Airport museum.